The Space Shuttle Columbia (OV-102)was a spacecraft used by NASA to fly into outer space. It was the first Space Shuttle to fly into space, on April 12, 1981. It broke apart while re-entering the Earth's atmosphere on February 1, 2003, killing all seven people who were on it at the time. The shuttle flew a total of 28 missions. The Columbia was named after a US Navy ship that circumnavigated the world in 1836. It was also the name of the Apollo 11 Lunar Excursion Module. A piece of insulating foam from the external fuel tank peeled off during the launch 16 days earlier and struck the shuttle's left wing. 28 16 January 2003 STS-107 39-A Did not land (Planned to land at Kennedy Space Center) Earth science research mission. Shuttle destroyed during re-entry on 1 February 2003. 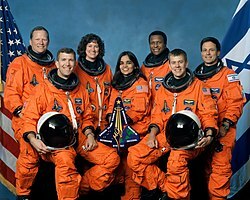 All seven astronauts on board died. ↑ "Space Today Online - Space Shuttle Stories". spacetoday.org. Retrieved November 19, 2010. ↑ "Columbia's Problems Began on Left Wing". Space.com. Retrieved February 26, 2008. ↑ "Molten Aluminum found on Columbia's thermal tiles". USA Today. Associated Press. March 4, 2003. Retrieved August 13, 2007.